The child must participate with one parent and be walking. Three major themes emphasize visual perception, development of large muscle groups, and body awareness which includes; balance, rhythmical, and manipulative skills. Children work individually with their parent and instructor at their own pace learning to try new tasks in an atmosphere designed to create good feelings about one’s self. Parents are encouraged to use word phrases to promote good feelings and encourage a spirit of willing cooperation with their child. Children are ready for the next class when they appear confident and are nearing 24 months old. Children begin working with the whole group for part of the one hour class. Class includes; weekly welcome activity, a musical warm-up activity, and various themes are introduced through out each ten week unit. 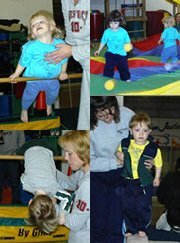 Movement themes includes; body awareness, gymnastic positions, locomotor skills, use of bats and balls, and basic rhythmical activities. During each class children also work fitness skills and explore fundamentals of pre-gymnastic skills appropriate for their age. Youngsters attend class without a parent. Parents are asked to remain in the background during the class. We wish to encourage steps towards independent behavior. Unit themes include development of locomotor skills; bats, balls, kicking, striking, swinging, throwing, and an introduction to creative rhythms as well as other simple games. Music, colors, shapes, letters, listening, and following directions are part of the program. 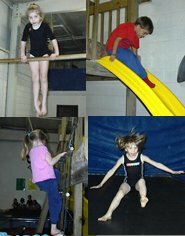 Learning to focus on simple fitness and pre-gymnastics skills are encouraged. Many basic skills have been accomplished when children leave this group. Activities center around locomotor skills, swinging, striking, kicking, throwing and more complex rhythm experiences. Fitness and gymnastics skills gain in complexity and children are offered many opportunities to work on their own in a structured environment. 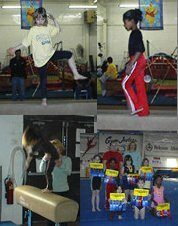 Boys and girls entering our Superbee tumbling, vaulting, beams, and bars. "In air" skills are safely learned in our "pits!" Children needing more time for locomotor skills get help while others may be progressing to gymnastic skills. Children are grouped by ability. This activity is for girls with little or no experience. 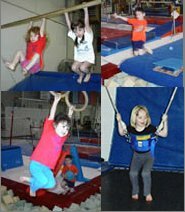 Girls will remain in this class until they feel very confident on all apparatus, can easily support handstands, cartwheels, rolls, and round-offs. It is important to be comfortable on the high bars and balance beams before moving to intermediates. Advanced beginner skills are taught in this group as well. This is a recreational class. Enjoy! Have fun. Boys should have enough arm strength to support on rings, parallel bars, and pommel horse. Other events include; tumbling, trampoline, vaulting, and pit use. Conditioning for strength and flexibility are an important part of the program. Instructors will notify students when they are ready for this more advanced level. Students need to be ready in all areas, especially in strength and flexibility. Boys and girls classes are separate. Placement is made by ability and readiness to work on even more difficult skills. Progress can lead to team placement if interested. Jr. Trainers is designed for children aged 6-12 years. Team evaluation sessions will be held periodically.